CodeBroker, a white-label mobile solutions provider, recently completed an in-depth study of its customers’ mobile promotions. The study revealed some interesting findings about A/B testing campaigns and mobile coupon redemption rates across marketing channels. The widely-accepted rates for coupons obtained from free-standing print inserts is .5% to 2%. Redemption rates for email coupons delivered through desktop channels is around 2.7%. Subscription-based coupons were redeemed at an average range of 3%-10%; however, select promotions run by CodeBroker clients saw rates as high as 13%. On-demand coupons (one-off promotions accessed by entering a promotional code) are redeemed at much higher rates, typically between 30% and 50%, with some promotions garnering a rate as high as 85%. Coupons delivered via email accessed through a mobile device were redeemed at slightly higher rates than desktop-delivered email, typically within a range of 2%-4%. Retailers who combined email with SMS saw redemption rates between 15% and 25%, substantially higher than email-only offers. A 3.1% redemption rate for the first three weekends of SMS-only coupons. 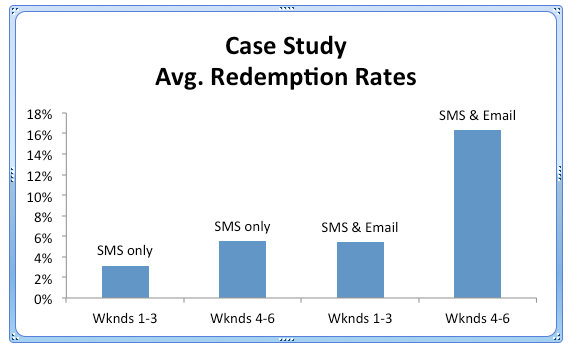 A 5.5% redemption rate for the second three weekends of SMS-only coupons. A more “exclusive” 25% discount offer (sent to the same recipients on Thursday instead of Friday) sent via SMS and email garnered a 5.4% redemption rate. A follow-up message sent via SMS reminding “exclusive” consumers that the offer was about to expire drove the redemption rate to an average of 16.3%. Better results can be achieved by combining SMS with other channels, such as email. Codebroker has been a leader in retail mobile marketing campaigns for over seven years. Its mobile solutions have resulted in enriched customer experiences, enhanced brand loyalty and improved lift for brands in more than 24,000 locations in the U.S. and Canada. For more information, contact CodeBroker at (800) 928 7315 or visit www.codebroker.com. Full results of the study can be found by visiting the CodeBroker website. Alex Brown is a freelance author with over 10 years experience writing in digital marketing, media, technology and other verticals. His experience includes work for Adobe, Citrix, Target, MGM Resorts International, Yahoo! and other brands. He can be reached at AlexB@WordDirectME.com. The Point of Sale News relies on sponsors to stay in business – please let vendors know when you’ve seen them here on www.pointofsale.com.